Modern Christmas lore is expansive enough to fill an encyclopedia. We’ve got songs about reindeer and snowmen, weird elf traditions, and letters to Santa. But how much do we really know about Mrs. Claus? Marriage is a relatively new gig for Santa Claus. There’s no record of his original incarnation, Bishop of Myra St. Nicholas, having a wife. Although it’s not impossible for a fourth century Turkish bishop to have had a wife, the figure would expand and morph until, by the end of the 18th century, the bishop had transitioned into a full-time behavior monitor, jolly-maker, and bringer of toys. But even mythological love affairs don’t just pop up overnight. It would be years and years before Santa found his lady. The first mention of Mrs. Claus appears in the 1849 short story “A Christmas Legend” by missionary James Rees, in which a couple disguise themselves, angel-like, as travelers, and seek shelter with a family. As it turns out, the two strangers are not the Clauses at all, but long-lost family members in double disguise. Still, real or not real, Rees had created a legend. … if there is a patron saint who presides over this day which the nation devotes to feasting and giving thanks, as Santa Claus presides over the Christmas holidays, and if he has a wife, which of course he must have or he can’t be much of a saint, then this was the person who stood before me. That person, “keen and nervous, but benignant,” has come to the narrator with a list of complaints about the hazards of contemporary kitchen design, and she intends to get through the entire thing. Several times the architect attempts to speak; each time, Mrs. Claus smacks him down. “Don’t interrupt me,” she says. Perhaps as a foil for Santa’s benevolence and cheer, Mrs. Claus continued to develop a blunt, take-charge attitude. While often sweet and helpful, she was also feisty. The Mrs. Claus of "America the Beautiful" writer Katharine Lee Bates’s 1889 poem "Goody Santa Claus on a Sleigh Ride" demands to accompany her husband on his rounds and wants to deliver the toys herself. 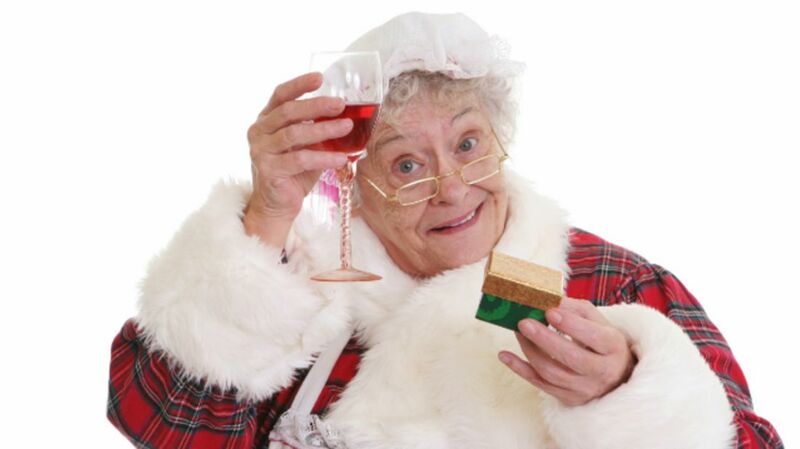 Over the last hundred-plus years, Mrs. Claus seems to have mellowed. These days she’s often depicted as a plump, cheerful helpmeet, filling Santa’s Thermos with cocoa and waving goodbye as his sleigh ascends. But no marriage is that simple. Mrs. Claus was a fireball once, and we like to think that, deep down, she still is.